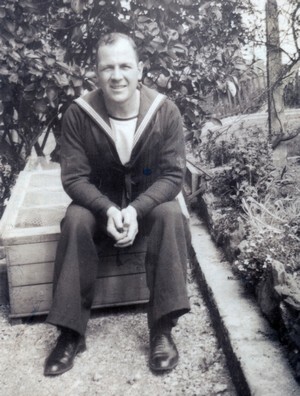 Leonard Herbert Thomas was born on the 27th of March 1912 in Portsmouth in the south of England – within half a mile of the Dockyard and historic Naval buildings. He was the ninth surviving child of eleven, two further children having died at birth or in early childhood. His father, grandfather and great grandfather all had the sea in their veins, having been in the Royal Navy and the Coastguard Service. When he was born his father was by now a semi-invalid, having been pensioned out of the Navy following an accident. He received a very small pension and so, with his wife, they supplemented this with making sailors’ uniforms for the Navy. A bright scholar (as indeed were many of his brothers) and a budding artist, he won a scholarship to the local Art College aged fourteen and a half, but such was the need for his contribution to the household income, that his mother sadly had to refuse this and so he started working at various jobs around, and related to the harbour. In 1929 he joined RRS Discovery II and completed five voyages to and from Antarctica (for which he received the Polar Medal at Buckingham Palace from King George VI), the last voyage being in 1939 – the outbreak of World War II. He joined the Royal Navy in 1941 with the rank of Diesel Greaser. In February 1942 he joined HMS Ulster Queen and served on four Arctic Convoys to and from the Russian ports of Murmansk and Archangel*. Following this he served in Anzio, Salerno, Malta and the Far East. From diaries he wrote secretly on board ship, his daughter Leona has transcribed his memoirs, which she discovered after his death in 2000, aged 88. These excerpts come from his experiences on Convoy PQ 18 which left Loch Ewe in September 1942. After the war, Leonard married his Irish sweetheart, Louise, in Belfast, having courted her throughout the war. He eventually found a job as an electrical engineer and they both moved to Edinburgh in Scotland, where his daughter Leona was born and where they spent the rest of their lives until he died aged 88 in 2000. I began to say, ‘It’s about time I had a look at Archangelsk,’ so one evening I went off on my own and purposely walked to other places than the main street of this now mournful city. I saw some evidence of bomb damage to these huge blocks of flats in which the community lived. While I walked in these lesser-seen parts of Archangel the infrequent ‘tram’ slid by, curious droshky-like transports which were a kind of open sled of large size and seemed to bring workers from the forests to change shifts, as it were. The occupants, if they saw me, never made any sign of life, but huddled together, sat or lurched as the ‘tram’ heaved its way up and down the wooden roadways. No-one spoke to me, but when I began to walk on a long curve back towards the river, I was suddenly checked by a sound I’d never heard before. It came from behind me. A low, musical sound of voices like a strangely-muted choir, but singing with a rhythm, a marching beat, which rose and fell and slowly grew as it came towards me. There was no mistaking it. It was people on the march, soldiers. As I stopped, standing in this empty road, a large body of troops came towards me, louder and louder, yet not raucous singing as some soldiers are prone to do. This was a choir on the march by the harmonious and passionate way they sang. It almost made my day to hear them as, in rows of about six abreast, they seemingly needed no conductor but kept up the long melodious song, now and again the tenor parts soaring high and the baritones taking the full weight of whatever the song was about. Even to hear it was a pleasure and gave me a lasting thrill for here, marching past me, was something worth seeing. But I was even more surprised to see women also marching among the men, and in similar greatcoats of a very dark grey and the regulation Russian boot, with the peculiar thick felt crowned cap with fur flaps to cover the ears, they strode in the same way as the men. I have often felt what a marvellous painting it would have made. A heavy snow-laden sky, with this spirited body of singing soldiery coming out of it, swinging along with such pride; you would have to try and understand this soul of Russia. They passed in about ten minutes and even as they passed in such numbers, they took up the refrain and hardly lost the essential beat – like a well-rehearsed choir. In another few minutes they had gone by, towards Archangel. They had not even seen me. I jotted down the tonic sol-fa of the tune they were singing as soon as I could, and have at times, looked at it and remembered it. I know that I was perhaps fortunate to be at that spot at the right time. I walked steadily back towards the river, a solemn flat mass, pewter-coloured and so sluggish. From the position I was in I could see quite an extent of this broad river. To my left, upstream, it vanished into forest and a mysterious and vague-looking distance. But to my right, here it widened out into a large estuary to show the far rise of the Kola Peninsula. I looked once or twice to make sure – I saw what I thought was ice. Surely not. And yet I was certainly able to recognise it, albeit from this considerable distance. To prove it, I looked at the sky in the far distance, and whereas the sky in the near-distance gave the reflection of open, dull-coloured water, so the ice-blink to the far north was very apparent. I knew I was right. It now occurred to me that should we be subject to north, north-westerly or even westerly winds, we could find ourselves having ice in this estuary very soon, as it would be channelled into the White Sea by pressure against Novaya Zemlya and the fresh water emptying from the Dvina would soon join up with the ever-ready snow which always seemed to fall, so perhaps, now well into November, this might be our way out. Unless we got out before the icing-up that lasted for five or six months, our prospects of ever getting home could look grim. I felt my walk was proving more interesting than at first I thought it might have been. The fact I never saw anyone else walking made it all the more curious. Probably I was being observed or viewed from buildings which now grew greater in number as, at last, I got to slightly more familiar parts of Archangel. It might have been a lonely walk had I not come across what I had. I saw a kind of junk shop – that was as near as I can describe it, for there were things heaped on the floor, in the windows, but in no semblance of order or display to advertise or attract. I waited to see if it was a shop of some kind, whether anyone else went into or came out of it, unsure, but certainly aware I might find it not what I expected, when I saw some oil paintings rolled up carelessly and lying on the floor. It occurred to be that I could stow them in my locker and that as a kind of souvenir they might be worthwhile. ‘Here goes!’ I thought, and entered the shop quite prepared to be told ‘Ne panemayo’  or ‘Nyet’  and words to tell me I had come to the wrong place, this was their front room, or something like it. But instead, a woman complete with headscarf tied tightly over her head, and neck and ears well hidden. I pointed to the canvasses. ‘Spasibo?’  I inquired. She looked and was utterly unable or unaware of what my request meant, my accent of Anglo-Saxon Russian was completely unknown to her. She said and did nothing. As I pointed to the rolls she just nodded and there we were again. I wondered if a gesture of desiring to make a purchase might help and so I hauled out some rouble notes, and to a certain extent that helped. She began to talk and at such a rate I could only look admiringly at her, unable to reply. I knew it was futile to carry on thus, and so I just put up my hands to request her to desist while I made some gestures. First I gestured – could I see the pictures? She understood that in record time, and thus we proceeded. We unrolled the canvasses, one inside the other and true enough, here were two pictures, recognisable as scenes of Russian life. One showed a forest scene with plenty of trees and snow; the other what could be the inside of a factory or sawmill or such, with huge steam-pipes visible. The canvasses were in good condition. I made some further gestures. I wanted them, both, hands motioning the exchange of ownership to me from her and now, the big question. How much? How many roubles? The honest blue eyes looked hard at me, unable to come up with the answer I was waiting for. She began to shake her head slowly, as if to say, ‘I’m lost, what are you saying?’ while I was trying hard to get her to point to some denomination on a note – the fifty, the hundred or whatever to give me a clue. But we weren’t moving ahead. At last, I motioned, in writing the amount I would give of my pile. I received no help from her. Only as a last resort, when I motioned ‘Wait, I have an idea!’ and from my pocket I drew out a packet of cigarettes, did she show any signs of animation. At first she looked at them, and immediately began to roll up the canvasses again. It seemed to me that this was the nearest I’d seen to a shop, yet I had the awful feeling someone was selling the contents of their home, and for a moment or two I felt a bit uneasy. The language barrier was not a help and here was this oldish woman looking intently at me as I was dying to ask what else there was or were there any quality goods to sell, or was I in the wrong shop? Imagine yourself in somebody’s front room, in a mean street, with no curtains at the windows, or any indication whether it was a bona-fide shop or not, only the fact that there were things which seemed for sale or barter, and more significantly the door was open, and you have a rough idea of how I saw myself. I hesitated, wondering how I could take my leave of this woman. She, on the other hand, could only stare at me. But I could stay no longer and at last I used the Russian word which was the equivalent of ‘thank you’ that phonetically was ‘Puzhoust’, and bowed slightly to her. I was almost out of the door when I saw a heap of gramophone records, most in their sleeves. The old type, heavy and up to an eighth of an inch thick. There must have been perhaps fifty, and for a moment I hesitated. I wondered if I could manage them as well – not the fifty, but perhaps a dozen, and call back tomorrow for them. Again the language, but – ‘Here goes,’ I thought, and turned, pointing to the pile. I gestured to her – ‘I will call tomorrow for some of these’. The blank stare was all too obvious, so once again I would have to mime ‘tomorrow for some of these’. How to mime that? I tried showing my return to the ship, and sleeping, then rising and coming up here. It was partly successful! She used a word which sounded like ‘Zhavtra.’ We kept repeating it though my pronunciation was hopelessly wrong, but with encouraging ‘Da—da’s  I got somewhere near to it until I could get her to accept my statement that I’d come along tomorrow. In the meantime I had to find my way here for in Archangel it was a case of so many streets and certainly the buildings looked the same, so as I returned I made doubly sure I knew the way and thus I finally got back on board. Not many fellows were interested, they were not impressed with the paintings and so I wasn’t mobbed by anyone with intent to buy them off me. I did return the next day, as liberty was easy to arrange and I made it to this ‘shop’ and traded another packet of cigarettes, and being sympathetic to this poor woman, I gave her a tablet of Lux toilet soap. The remarkable thing was that in choosing a dozen records at random, my wild choice turned out to be so fortunate. Twelve records hugged to my chest, not even a paper bag or such to carry them in, but the slippery ground to negotiate, made me well aware of how I could easily fall and smash the lot, so I walked very carefully back to the ship.